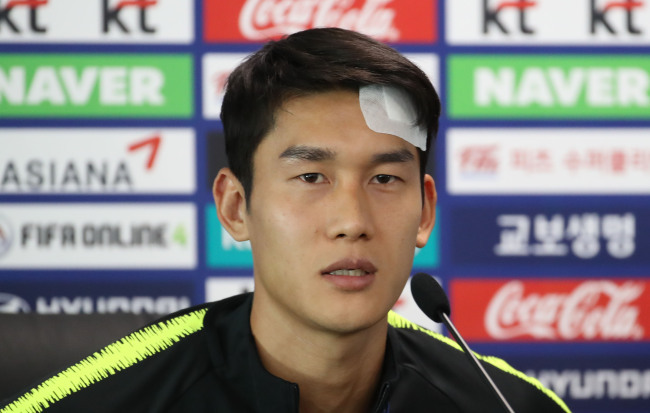 SAINT PETERSBURG, Russia -- -- South Korean right back Lee Yong said Thursday he is confident man-marking Sweden's playmaker Emil Forsberg when they face each other in an upcoming World Cup match. South Korea are in World Cup Group F with Sweden, Mexico and Germany. The Taeguk Warriors are scheduled to have their 2018 World Cup opener with Sweden at Nizhny Novgorod Stadium in Nizhny Novgorod, Russia, on Monday. Lee, who plays with South Korean club Jeonbuk Hyundai Motors, said he is confident of stopping Sweden's No. 10. According to South Korean head coach Shin Tae-yong, Forsberg is listed as left winger, but he usually plays in the center to create chances. "I know Sweden's No. 10 cuts into the center," Lee said ahead of training at Spartak Stadium in Lomonosov, a suburb of Saint Petersburg. "I'm used to the man-marking role, so I think I can do it." Lee had to get stitches on his forehead after he was elbowed by a Senegalese player during a friendly match in Austria. He suffered a laceration of about 7 centimeters. However, he said he will be fit to play against Sweden. "I have no problem training with the team," he said. "It's getting better, and I think I'll be able to play against Sweden." As a full back who also has to make overlapping runs, Lee said he is also ready to help attackers up front. "We have quick attackers like Hwang Hee-chan and Son Heung-min, and it's important to help them play with their pace," he said. "We're having lots conversations to execute the moves." Lee, who has 28 caps, said South Korea should work as a team to defend physically strong Sweden. "I know they are physical and like to play a long ball," he said. "We are trying to win the second ball after the aerial battle, and we're talking lot about that." Lee, who is the oldest player on the South Korean squad at age 31, said he is asking the players to compete without regret, even though they are viewed as underdogs.